Did you ever have something unexpected happen? Let’s say, you’re going about your everyday business, everything perfectly normal. When, something out of the ordinary happens. Comes out of left field. Knocks your socks off! Could be called a miracle, even! That’s what happened in our Scripture passage from Acts chapter 8 today. Something certainly out of the ordinary happened to the Samaritans! I’m continuing with my Summer Sermon Series from the book of Acts, Postcards from the Early Church. But before I continue, I’d like to thank everyone for the opportunity to take a week to go to a church conference, the New Wilmington Mission Conference in western Pennsylvania. I hope everyone enjoyed Pastor Gordon as he preached and led the service last week in my absence. The mission conference was a marvelous opportunity to see what God is doing around the world in mission and outreach. Reaching out to people with the Good News of Jesus Christ. Surprise! It’s just what the apostle Philip was doing, in our Scripture reading today. It’s only a number of months after that first Pentecost. 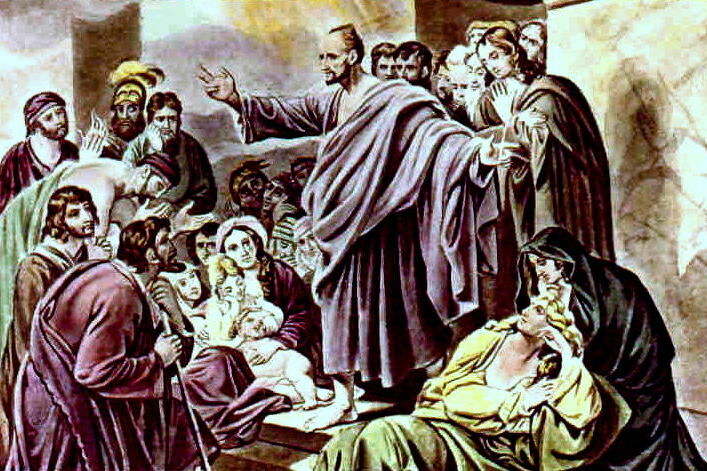 The apostles have been preaching and teaching up a storm. The fellowship of new believers in the risen Messiah has been growing by leaps and bounds! When—we have the super-deacon Stephen get hauled up before the authorities. You remember, just like a radio serial. “When last we left our intrepid heroes . . . !” Only, things went from bad to worse for Stephen. Some things he said about God really got the authorities mad. They thought he was saying blasphemous words, so they stoned him to death. And, God rest his soul. 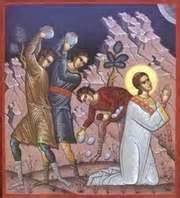 Stephen was the first martyr of the Church. You might have guessed that Jerusalem was no longer a safe place to stay for many early believers in the risen Jesus. The apostles and other church leaders left town in a hurry! The early believers in the risen Messiah were ALL Jewish. Everyone in the first church in Jerusalem was Jewish! The first few months were like a greenhouse; this growing church was spreading like a wild fire! But the sudden death of Stephen brought the rapidly growing situation in Jerusalem to an abrupt end. Which brings us to Philip, one of the apostles. His task is a continuation of sending. The Greek—the original language definition for apostle is ‘one sent on a mission.’ So, Philip is doing his job! Doing what Jesus told him to do. One problem: Philip was not preaching to Jews. This is unheard of, at this point. Preaching to Jews? Acts 8 says clearly that Philip—one of the Jewish apostles—went to Samaria, an area some ways north of Jerusalem. There’s a problem: no self-respecting, kosher-keeping Jew would willingly go to Samaria! Let me tell you a little about the Samaritans, a tribe of people forcibly brought to Israel several centuries before. As John Petty says in his Lectionary blog, “Samaritans and Jews were all-but-enemies. Centuries of insults and provocations had made each group so disgusted with the other that Jews travelling to Galilee or Judea would usually opt to take the longer route through the area across the Jordan River rather than set foot in Samaria. I think you all can see where the problem lies. Jews hated Samaritans! Samaritans hated Jews! A racial issue! A huge barrier in relationship stood between them! Just a minute. Let’s step back. Barriers between people? Misunderstood and marginalized people? Differences in religion, even heretical viewpoints? Sounds like a mission field to me! This past week at the mission conference, I heard about mission outreaches that crossed all kinds of barriers. Differences in language, religion, culture, and viewpoint. Differences in urban people going to rural places, Christian worldview meeting Buddhist or Hindu or Moslem worldview. Wide differences in cultural views and assumptions. And—that’s just on the missionaries’ side. I don’t have time to go into the topic of evil, or impure, spirits at this time. I’ve been preaching a midweek bible study for the past few weeks on Angels: Elect and Evil. I’m going to do a “coming attractions spiel.” If you’re available this coming Wednesday at 11:00 am, step on down to this very room! If the weather is hot and toasty outside, come on in. We have air conditioning. This week will be the final session, on demons. Or as they are sometimes referred to, evil spirits. But, wait! There’s more! Apostles Peter and John show up, wondering what is going on. What did Peter and John think of the Samaritans? Dr. Luke doesn’t tell us, but I suspect they had similar feelings to their fellow countrymen. I have another question for you: What do you think about crossing barriers today? What about outreach right here, right now? What about an Indian church, culturally different from St. Luke’s ? Oh, wait! The dancing classes St. Luke’s Church hosts during the week come from a Catholic Indian church. What about a language barrier, where a different group of people uses a completely different alphabet? Oh, wait! What about Love Sharing Disciple Church? Our Korean friends who worship in the sanctuary here at 12:30 pm. Do you think Jesus included everyone in His invitation to come to Him? Or, did He say, “Oh, everyone is invited, except for people with physical problems.” That would put my friend and church elder Bob out of the picture, because he has a withered arm, withered from birth. Or, did Jesus say, “Everyone is invited, except for people with disabilities.” No! Remember my friend Pastor Joe, who was at my commissioning service? He’s blind. Did you all hear? It doesn’t matter whether the Jews despised the Samaritans. God would help the Jews to love the Samaritans. They still needed to introduce Samaritans to Jesus. Did you all hear? The apostles needed to go to the ends of the earth. Praise God! That’s just what they did. Did you all hear? It doesn’t matter what kind of barrier you and I are need to cross, God is there to help. We can overcome language differences, culture or worldview problems, religious differences. Remember John 3:16? For God so loved the world that He gave His only-begotten Son.” For you, for me. For everyone. God loves the whole world. What part of “whole world” do we not understand? Peter and John were finally convinced. God does not divide or isolate persons one from another. Instead, Peter and John prayed and laid hands on the Samaritan believers. What happened? The Holy Spirit came upon the Samaritans. The Holy Spirit came with power to the Samaritan believers as well as the Jewish believers. God is all about mission. Outreach. God is a sending God. It doesn’t matter if we are moved to reach out to our neighbor across the alley, to our community with the Maine Township Food Pantry, to the poor and marginalized of Chicago with Bundled Blessings diaper pantry, or to a mission outreach halfway around the world with Dana and Carolyn Belton, with SIM Ministries in Zambia. In this way, we are following the command of Jesus—to go to our Jerusalem, our Judea, our Samaria, and to the uttermost parts of the earth. We have that opportunity, too. We can reach out, say ‘hello’ to someone who looks different—sounds different—worships differently. I have accepted this challenge! This opportunity. This challenge. God would like you to accept it, too! When you have a crisis or serious situation around the house, or personal matters that require some assistance, who is the first person you think of? Who is dependable, helpful, and downright handy to know? Who always seems to have the answers, provides service, and responds in a cheerful, friendly manner? Do you have someone in mind? That’s who, that’s what I think of when I think about Stephen, one of the first deacons of the Early Church. Here we are, in the next installment of our summer sermon series from the Book of Acts, Postcards from the Early Church. I’ve mentioned this before, of how this sermon series reminds me a bit of a radio serial. “When last we left our intrepid heroes . . . “ Last week, we took a look at the first recorded church conflict, in Acts 6. This tension and conflict revealed itself in a dispute over the care of widows. It escalated into a problem between two separate groups of believers in the early Church. Jews separated by language and by culture. One Greek-speaking group of Jews—a minority group—claimed they were being overlooked, and were being left out in the charity distribution to widows. Remember, the twelve Apostles needed help, so they called upon the whole congregation to choose deacons, people of good standing, stature, and wisdom to serve the congregation. Among these Greek-speaking men was someone named Stephen. Like the others, he was appointed and ordained to take care of social welfare matters in the congregation. In these deacons, we have seven respected believers, people of wisdom, with Greek names. What’s more, one man was even a proselyte, a convert to Judaism. These Greek-speaking believers were good stewards of the gifts God had entrusted to them. They were also good stewards of what the congregation in Jerusalem had entrusted to them, too. The book of Acts is not specific, but I can imagine them taking up their new duties. Going around the main part of Jerusalem and perhaps the suburbs, too. Checking up on the widows and those who could not come to services regularly. Making sure that the elderly, the young ones, and the infirm had enough to eat, and if need be, medical care. In this way, the deacons freed up the Apostles to continue in prayer, and preaching and teaching God’s Word. Whatever they were doing must have done the job. We can see, as Dr. Luke said, the number of believers continued to grow—and grow! What about us, here, today? Think about the things God has given you stewardship over. What gifts and talents do you have to offer the church? What can you offer to your neighbors? I’d like you to think about that, as we continue to look at Stephen. Remember how I opened this sermon? How I asked everyone here to think of someone who is dependable, helpful, and downright handy to know? Who always seems to have the answers, provides service, and responds in a cheerful, friendly manner? I just so happen to have someone like this in my extended family. My brother-in-law, married to my husband’s sister. Rick is one of the nicest guys you could meet. He was a volunteer fireman in his small town. Now he’s a fire inspector in his region of Michigan. But that’s not what I wanted to highlight about Rick. Instead, he goes above and beyond when he’s asked to help. Now that my father-in-law is in his mid-eighties, my husband and I are sure glad that Rick lives only about a half hour’s drive away from Grandpa Jones. Rick is handy around the house, always keeps a cool head no matter what, and is just a swell guy to have around. Not only that, he’s an elder in his Presbyterian church, and a pillar of the community. Very much the kind of person I imagine Stephen to have been. It seems that Stephen is not only an outstanding deacon, excellent at serving others in the congregation, but I understand God has blessed him personally. Abundantly. He is an excellent steward of both his personal gifts, as well as God’s gifts of life and blessing for others. He must have been articulate, too. Fantastic at expressing himself, with wisdom and holy insight. Stephen continues to be a stand-out steward of the gifts God has given him. Even in his lengthy defense to the High Council—he takes almost all of Acts chapter 7 to go through the history of the nation of Israel, showing how ungrateful and stiff-necked the Jewish people are. Radical stewardship, indeed. He gave generously of God’s gifts of life and blessing for other believers. Such a stand-out, he was martyred for his stewardship of his gifts. This is what this church does. This church has a regular collection of food for the Maine Township Food Pantry. We feed the hungry and provide for God’s table of grace. This congregation shares food—and we share God’s gifts of life—with the hungry, with the vulnerable, with those in need. This is serving in the way that God wants us to serve. Do you share God’s gifts of life, every day? Do we provide God’s table of grace for others, regularly? God calls each of us to be generous, each day. Be of service, one on one. Be excellent stewards—personally. God is calling, to you, and to me. Won’t you answer? Hospitality + Service = Discipleship! I attended an Interfaith Panel discussion last Tuesday evening at the Muslim Community Center here in Morton Grove. The panel had representatives from five major faith traditions here in the Chicago area: Baha’i, Christian, Jewish, Muslim and Sikh. Each gave their religion’s basic approach to serving those in need. Charity. Service to those less fortunate than ourselves. I appreciated listening to diverse views on charity and assisting the needy. I want us to focus on the New Testament reading from Acts on—surprise! Charity and assisting the needy! My recent evening with the Interfaith panel has an unexpected tie-in to the bible passage from Acts this morning. I planned and set out these passages and these sermon topics almost two months ago, before I was ever contacted by the Interfaith Outreach Committee at the Community Center. Was I surprised to find out that the topic of last Tuesday’s evening fit right in with today’s reading from Acts—and today’s sermon. What is the situation for the group of believers in the Risen Jesus? The early church? That’s the situation. Everything seems to be going well for this growing group of believers! Attendance in services is up. Plate income is increasing. The apostles—the pastors of this growing flock—are busier than ever. Everything is on the upswing. When—a complication comes up. I need to give you all some backstory, so you can get the full picture. (I appreciate the Rev. Bryan Findlayson’s concise explanation.) At this point, just a couple of months after that first Pentecost, the birthday of the Church, all the believers were Jewish. Jerusalem was a large city in that area. It was the time of the Pax Romana, the Roman peace, and Jews from all over the known world returned to the city of Jerusalem and settled there. Do you hear the problem? Two separate groups of people in the early Church, and one group—a minority group, no less—claimed they were being overlooked. Discriminated against. Or, rather, that their poverty-stricken widows, who were part of the group of believers, were being left out in the charity distribution. Welfare budget. Or almsgiving to the poor. Whatever you call it, a group of people was getting left out. I don’t think that anyone was left out on purpose. What I do know—by Dr. Luke’s report—is that the Church in Jerusalem was growing by leaps and bounds! This is a good problem to have! In a large group of people going through such rapid growth, unfortunate things happen. And, it’s inevitable that someone ends up getting overlooked. Some people’s needs just aren’t met. These verses in Acts show us the first rumblings of church conflict. The Apostles could have gotten anxious and started to fret. Or, possibly started micro-managing and overseeing each little thing in the distribution of food. Or, called a board meeting, and appointed a task force to study and look further into the treatment of the Greek-speaking widows. But did they? No. The Apostles faced the conflict directly, and responded in a proactive way. What about today? People have definitely not stopped being hungry. What about communication problems? What about the local food preferences? How should those be handled? What if several different faith traditions in our area have conflicting methods in the distribution of food? Are there any hungry or needy people—unintentionally—getting left out? Let me tell you more about the panel discussion and dinner at the Muslim Community Center last week. I heard diverse views on charity and assisting the needy. Yet—they were not so diverse, after all. I saw in all five faith traditions a deep concern for those with less, and a desire to come alongside and help where possible. I also appreciated breaking bread with such a diverse group of friends, after the evening service. Yes, Baha’i, Christians, Jews, Muslims and Sikhs do come from different faith traditions. Yes, the Muslims are observing the holy month of Ramadan. Yes, Muslims commonly fast every day during the daylight hours during this month. The Community Center invited a large group of people to join together with them for this discussion and for the Iftar dinner after sunset, to break the fast at the end of the day. Back to Acts. True, these Aramaic-speaking Jews and Greek-speaking Jews from the book of Acts were both of the same faith tradition. However, there were big cultural and language differences between them. So, what happened? How did they solve this problem? The Apostles had the whole group of believers choose seven upright, worthy individuals to be responsible for the distribution of food and goods to this minority group. What I find the most interesting? The seven men all had Greek names. I suspect they all were Greek-speaking Jews, themselves! How awesome is that. The other believers showed great sensitivity in selecting seven servers, seven people who could oversee distributing of food. Seven men with Greek names. What’s more, one Greek man was even a proselyte, a convert to Judaism. Imagine that! Dr. Waddell asks: how do we become this kind of person/or these kinds of congregations in the Church and for the world today? Great question! We can start small, with a small act of kindness each day. A small act of hospitality, of welcome and greeting each day. Each one of us is called to be welcoming members of this church today. Each of us is an individual, true. However, Lone Ranger Christians are not a good idea. We need to support each other, be kind to each other, and support the wider community. What about you? Are you going to be a welcoming person, both here at church, and at home, as well? No matter what the cultural differences, no matter where people come from, we are all called to be welcoming. Just as Jesus was kind and welcoming to all people, throughout the Gospels, we can all follow His excellent example. That’s what His disciples do, to the best of their ability, in the book of Acts. And, that’s what all of us can do, here in the church, and everywhere else, too!